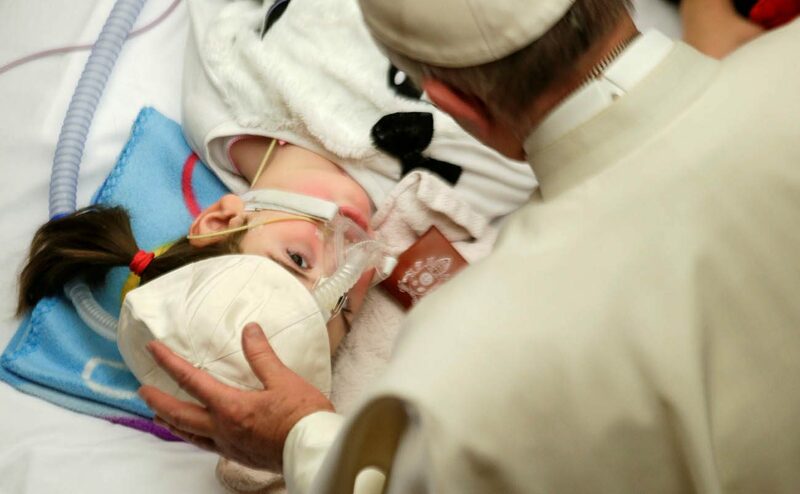 VATICAN CITY (CNS) — Corrupt business practices that seek to profit from the sick and the dying are a cancer to hospitals entrusted with the care of the most vulnerable, especially children, Pope Francis said. Doctors, nurses and those who work in the field of health care must be defined by their ability to help their patients and be on guard against falling down the slippery slope of corruption that begins with special favors, tips and bribes, the pope told staff and patients of Rome’s ‘Bambino Gesu’ children’s hospital Dec. 15. The pope held an audience with thousands of young children, parents, doctors, nurses and volunteers from the hospital. Making his way into the Vatican’s Paul VI audience hall, the pope greeted many of the young patients and their families who reached out to him, handing him letters and messages. At the main stage, he sat in his chair surrounded by some of the young patients while listening to testimonies and questions from hospital staffers and a former patient. Saying that there was no clear answer to the suffering of the innocent, Pope Francis said that Jesus responded to this question not by “preaching or theoretical discourses” but by offering meaning to suffering through his death on the cross. “‘Why do children suffer?’ There isn’t an answer to this; only by looking at the cross and allowing (Jesus) to give us the answer. You may ask me: ‘But father, didn’t you study theology?’ Yes. ‘Didn’t you read books about this?’ Yes. ‘So, what is the answer?’ There is none. Look at the cross,” he said. Hope, he continued, is the “fuel” of Christian life that doctors and nurses are called to give to young children who are suffering, and being close to them “is the medicine so the heart does not freeze” and become numb to their pain. Those who work in the field of medicine and health care, he added, can be witnesses of holiness by “sowing life” through small, often hidden, gestures that flourish and give fruit. “There was a French author who loved to say that the ‘middle class’ of holiness is made up of those who are always hidden but are there present through the holiness that is done every day through small things. Thank you for what you do,” the pope told the hospital staffers. Pope Francis also praised Serena Antonucci, a former patient of the hospital who shared her experience of suffering from Hodgkin’s lymphoma at the age of 13. Now in remission, the 27-year-old is studying medicine to help young children who suffer like she once did. “In the bible — in the Book of Wisdom — there is a verse that speaks about a strong woman. We have seen one today: Serena, this strong woman who overcome pain. To all of you who work at ‘Bambino Gesu,’ women like this — strong men as well — are your greatest reward. The best reward is to see the results of your work in children and in people,” the pope said. Pope Francis said that doctors and nurses like Serena save lives not only through their expertise but also by bringing joy, happiness and hope to those in need. “The happiness of sowing life, of making life grow and to see how these children grow as strong men and women; this is joy, this is hope and this is your reward,” the pope said.